Wanda provides information about a number of Annual Events. Make sure you find out more information and see how you can be a part of them. 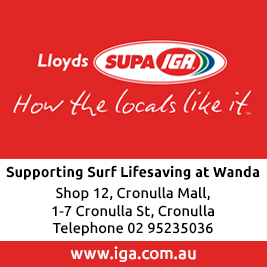 Wanda Surf Life Saving Club will host the 93rd Annual Cronulla-Sutherland District Interclub Carnival on Sunday 24 March 2019. 8:00am Start U/15s – Opens + Masters. Click here for event program. SSV INDUCTION COURSE 31 MARCH 2019 Wanda SLSC will run a series of SSV Induction Courses March/April 2019. 31st March 11AM 11th April 5:00PM Members must: Be financial Hold a drivers licence Have updated their Members Portal with their current expiry date on their licence (contact the office if assistance required 9523 4343) Not be under the influence of any Drugs or Alcohol at the time of assessment Please contact Michael Bonnici, Club Captain for further information 0415 779 853. Monday 1st April, tee off at 7:30am at Burleigh Golf Club, Miami. Presentation luncheon after golf. From $70 per person. RSVP by 1 March to: warren@arrennie.com.au or alanwhelpton@bigpond.com See Aussies Golf Day Invitation for full details. SSV INDUCTION COURSE 10 APRIL 2019 Wanda SLSC will run a series of SSV Induction Course. 10th April 6:30PM Members must: Be financial Hold a drivers licence Have updated their Members Portal with their current expiry date on their licence (contact the office if assistance required 9523 4343) Not be under the influence of any Drugs or Alcohol at the time of assessment Please contact Michael Bonnici, Club Captain for further information 0415 779 853. 18-25 ENRICHMENT PROGRAM 2019 SLS Sydney invites nominations for the 18-25 Enrichment Program 2019. This program aims to foster networking opportunities and personal development in 18-25 year olds, to facilitate personal growth, leadership and engage participants through community awareness within Surf Life Saving. The program will be held in the Illawarra Branch, with accommodation at the Novotel Northbeach, Wollongong from Friday 12th – 14th April 2019. Registrations Close: 25/03/2019 Click here for course details. WANDA CLUB CHAMPIONSHIPS Wanda's Club Championships have been rescheduled for the weekend of Saturday 13th and Sunday 14th April 2019. All proficient SRC and Bronze members are invited to compete. The day and start times will depend on the conditions and will be advised closer to the date.